Then recite one Our Father, one Hail Mary and one Apostles’ Creed. However, in the Apostles’ Creed do not say, “descended into Hell”; replace that with “descended into the lower part of Purgatory”. I will give to those who pray this beautiful chaplet dedicated to me, peace. I promise to give great conversions. Let this be the second gift I will give. The most important is conversions. Please understand me clearly. This chaplet has great power for converting those you pray for, and yourselves. My Son and I promise to give to those who pray this chaplet, healing - physically, spiritually, mentally, and psychologically, but you must pray and firmly believe. I will give great graces to those who pray to me under the Mother of Mercy Chaplet. Look at the rays that I pour forth from the palm of my hand. These are the graces I ask you to pray for and receive, which I will give you. For now, the only thing I wish to say is that these graces are all kinds of graces, and I will not be limited by one particular grace. So please, pray. I promise those who pray this chaplet for the dying that I will be with them during their last moments on earth, and I myself, as Mother of Mercy will appear to them before their death and take their souls to God. Those are the five promises I wish to make and give to you through this chaplet, but there is also a sixth. I shall answer your requests, but you must be willing to receive the answer with an open heart. I will intercede to my Son Jesus under this title, and he will give to you the graces and prayer you desire, but you must understand, sometimes God’s answer is “no”. If it is “no,” then you must accept it and continue to move on. If the answer is, “no, but later on down the road,” then you must continue to persevere and believe firmly that this shall be given to you. And then there are “yes” answers. Those who receive the gift of graces of a “yes”, of an answered prayer and it comes to pass, do not give up on praying this chaplet for your brothers or sisters, but continue to pray. I do not simply want you to pray the chaplet for your own needs, and then once you receive what you desire, to walk away from this chaplet, or from me. Continue to pray even if you receive a “no,” a “later down the line,” or a “yes” answer because I wish to be with you always. This is one way that I am able to be present to you. I come to tell you this and I come to tell you of two new promises I wish to give, Me, your Jesus of Mercy, through the Chaplet of your Mother of Mercy. I wish to give purity of heart to all who pray My Mother’s chaplet. I also desire to give through this chaplet, salvation for the living and the dying. As you wear the Brown Scapular as a sign and pledge to My mother, it is also a shield and protection against the fires of Hell. So too is My mother’s chaplet a shield against the fiery darts of Hell. All those who pray it and believe in My mother’s title of Mother of Mercy shall receive salvation in this life and in the next. I promise all of those who pray My mother’s chaplet this. It is My promise, for those who pray it draw closer to My mother’s heart, and all those who dwell closer to My mother’s heart through this chaplet draw closer to My heart. Therefore salvation is obtained through this chaplet, if you so wish it to be. You must accept the graces that I am giving through this chaplet and through My mother, for she is the spring of everlasting delight and grace. I desire you to pray and to believe, for through this chaplet I am giving to you purity of heart and salvation for those who believe. I also desire you to know that the hour in which the chaplet should be prayed is at 4 o’clock. It was at 4 in the morning in which My mother was born. It was at 4 o’clock in the evening that My body came down from the Cross and My mother held my dead body for the first time. It was wrapped in linen and then the procession to the tomb started. She was there. It was at 4 o’clock in the evening that this happened. And it was at 4 o’clock in the evening when she died of joy, when it was time for her to die. She died of joy at 4 o’clock. The hour of her birth was also the hour of her death, only not in the morning but in the evening. Therefore at 4 o’clock is this to be prayed, every day at 4 o’clock, in honor of the mystery, joy, sorrows, and glories of My mother who is always with Me. Those who honor her honor Me. Those who will blaspheme her or dare to dishonor her with disrespect, they disrespect Me. 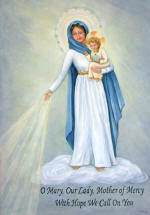 It is through My mother, the Mother of Mercy, that she leads you to Me. Her mercy is a mother’s mercy, unbound and beautiful. All who approach her receive the gift of salvation, and all those who approach her with faith receive the gift of love because she bears within herself the gift of divine love.